This winter, the Chandigarh TriCity will welcome music fans to two days of Jazz celebrations, featuring six bands from across India and the US, at the stunning Upstairs Club. The name ‘Open Hand’ plays off the iconic local Chandigarh landmark but also symbolises for the city, an openness to new cultures and art forms. In that spirit, the ‘Open Hand Jazz Festival’ will celebrate jazz and all its departures, featuring two days of blues, funk, soul, world and pop, alongside traditional jazz forms. So look forward to an event where the past, present and future of jazz combine and meld into one another. 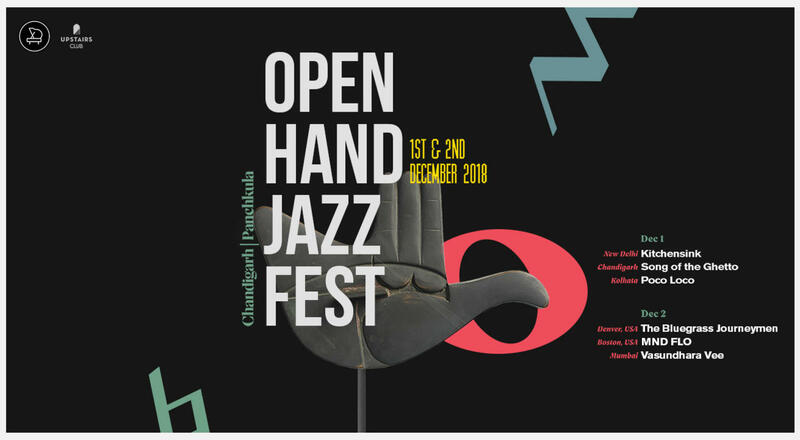 So come on in and discover your favourite new artist, and meet some of the leading jazz ambassadors from India and abroad like Pradyumna ‘Paddy’ Manot, Vasundhara Vee and Sharik Hassan, who will lead their ensembles at the Open Hand Jazz Festival. From Boston to Mumbai, accordions to vibraphones, contemporary to latin jazz, it’s a power packed lineup at the Open Hand Jazz Festival! Rostered with Shai Maetro Trio, John Mclaughlin 4th Dimension, China Moses at the Dhaka Jazz Fest, Vasundhara Vee has performed at every premier venue in India and on diverse stages in France, Turkey, Bulgaria, Malasia, Dubai, Singapore, headlining alongside Jojo Mayer and Eric Trufaz. She is regularly featured at Jazz Utav, Hyderabad Jazz Fest, Goa International Jazz Fest, Giants of Jazz, Shubha Mudgal’s Baaja Gaaja Festival, Serendipity Arts Festival among others. A collective of accomplished musicians aimed at presenting traditional American Bluegrass Music to the world. Each member performs in a variety of bands back home, bringing original tunes and a deep knowledge of the bluegrass traditional songs and history to the table. While traveling abroad they play gigs, plan musical outreach and organize cross-cultural musical collaborations and lessons with local folk musicians. Their 2017 India tour saw successful gigs at The Piano Man Jazz Club, Sofar Sounds and the US Embassy. While bluegrass music is central to the band sound focus, one can hear country, old time, jazz, swing and many other influences in their eclectic playlist. They’re a groovy mix of popular music with their own Latin jazz flavour. Pianist, Paddy began his piano studies at six, and he has since been extensively studying Western Classical, Jazz, Latin Jazz and North Indian Classical music. He has played at the Java Festival where he received accolades from jazz icons like, George Benson, Ray Hargrove and Joey De Francesco. His collaborations include artists such as trombonist Alistair Kay, star bassist Steve Zerlin, and Sumith Ramachandran. A regular at Congo Square Jazz Fest for 8 years, his quartet was recently also featured at the Panama Jazz Fest. A musical project led by Chandigarh-based accordionist/pianist Nipun Cheema, feat. Sonic Shori who has performed extensively across India at venues such as NCPA (Mumbai), The Piano Man Jazz Club (Delhi) and internationally at the prestigious Panama Jazz Festival. Aditya Dutta from the Piano Man Jazz Club house band and a sideman in top ensembles in the country. Hailing from vastly different parts of the world including India, France, Trinidad, Hungary, and Canada, MND FLO has found a never- ending pool of inspiration to draw from within this diversity. MND FLO's debut album "From Time" features an array of ethnic subtleties, as well as their apparent hunger for creating new vessels of musical expression. In a variety of musical settings, the members of MND FLO have individually performed at Newport Jazz Festival, Panama Jazz Festival, Cambridge Jazz Festival, Toronto Intl Jazz Festival, Blue Note Jazz Club NY, Jazz at Lincoln Center NY. In addition, they have performed and/or recorded with jazz legends including Herbie Hancock, Wayne Shorter, John Patitucci, Valerie Simpson, Thelonious Monk Institute, and more.